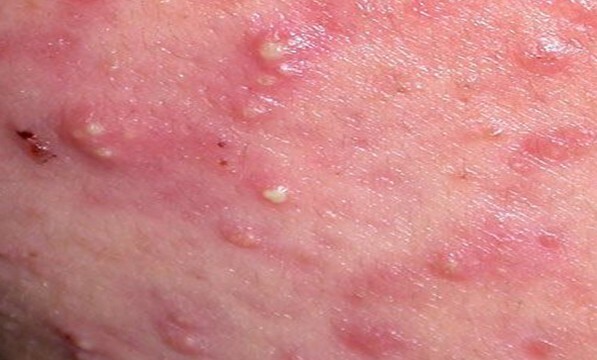 Acne vulgaris is a chronic disorder of the pilosebaceous apparatus caused by abnormal desquamation of follicular epithelium leading to obstruction of the pilosebaceous canal, resulting in inflammation and subsequent formation of papules, pustules, nodules, comedones, and scarring. The term acne is derived from Greek word “acme” which means “prime of life”. Although generally considered to be a benign, self limiting condition, acne may cause severe psychological problems or disfiguring scars that can persist for a lifetime. It is a pleomorphic disorder and can manifest at any time during life but it most commonly presents between ages of 12-24, which estimates of 85% of population affected. In recent years multifactorial nature of acne has been elucidated. An improved understanding of the pathophysiology of acne leads to rational therapy for successful treatment. • Acne is the most common skin disease in the U.S.
• It is most common in teenagers (highest incidence between ages of 16 and 18 yr). • Overactivity of the sebaceous glands and blockage in the ducts. The obstruction leads to the formation of comedomes, which can become in-flamed because of overgrowth of Propionibacterium acnes. • Exacerbated by environmental factors (hot, humid, tropical climate), medications (e.g., iodine in cough mixtures, hair greases), industrial exposure to halogenated hydrocarbons. • Laboratory evaluation is generally not helpful. • Patients who are candidates for therapy with isotretinoin (Accutane) should have baseline liver enzymes, cholesterol, and triglycerides checked, because this medication may result in elevation of lipids and liver enzymes. • A negative serum pregnancy test should also be obtained in females 1 wk before initiation of isotretinoin; it is also imperative to maintain effective contraception during and 1 mo after therapy with isotretinoin ends because of its teratogenic effects. • Contrary to popular belief, diet has little or no bearing on acne. Greasy foods do not cause acne. If the patient, however, feels that a particular food is exacerbating the acne, it should be avoided. 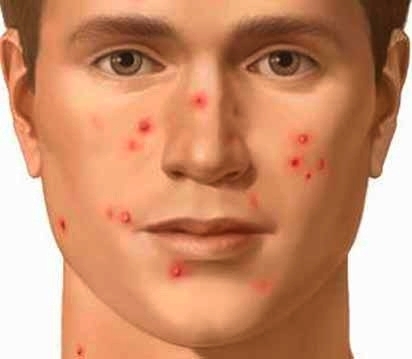 • Acne is not caused by dirt; therefore, excessive washing is unnecessary. • Long-term exposure to coal tar, machine oil, lubricating oils, and greases should be avoided; use of hair pomades containing oils should also be avoided; topical exposure to cocoa butter can also exacerbate acne and should be avoided. Treatment generally varies with the type of lesions (comedomes, papules, pustules, cystic lesions) and the severity of acne. • Comedones can be treated with tretinoin (Retin-A); it is applied generally once qhs; large open comedones (blackheads) should be expressed. • Patients should be reevaluated after 4 to 6 wk. Benzoyl peroxide gel (2.5% or 5%) may be added if the comedones become inflamed or form pustules. Topical antibiotics (erythromycin, clindamycin lotions or pads) can also be used in patients with significant inflammation. The combination of 5% benzoyl peroxide and 3% erythromycin (Benzamycin) is highly effective in patients who have a mixture of comedonal and inflammatory acne lesions. • Pustular acne can be treated with tretinoin and benzoyl peroxide gel applied on alternate evenings; drying agents (sulfacetamide-sulfa lotions [Novacet, Sulfacet]) are also effective when used in combination with benzoyl peroxide; oral antibiotics (doxycycline 100 mg qd or erythromycin 1 g qd given in two to three divided doses) are effective in patients with moderate to severe pustular acne; patients not responding well to these antibiotics can be switched over to minocycline 50 to 100 mg bid; however, this medication is more expensive. • Patients with nodular cystic acne can be treated with systemic agents: antibiotics (erythromycin, tetracycline, doxycycline, minocycline), isotretinoin (Accutane), or oral contraceptives. Periodic intralesional triamcinolone (Kenalog) injections by a dermatologist are also effective. The possibility of endocrinopathy should be considered in patients responding poorly to therapy. • Isotretinoin is indicated for acne resistant to antibiotic therapy and severe acne; dosage is 0.5 to 1 mg/kg/day in two divided doses (maximum of 2 mg/kg/day); duration of therapy is generally 20 wk for a cumulative dose =120 mg/kg for severe cystic acne; before using this medication patients should undergo baseline laboratory evaluation (see above). This drug is absolutely contraindicated during pregnancy because of its teratogenicity. • Oral contraceptives reduce androgen levels and therefore sebum production. They represent a useful adjunctive therapy for all types of acne in women and adolescent girls.